Chitosan is a polysaccharide-based biomaterial derived from renewable feedstock, such as the shells of crustaceans. Chitosan displays limited adsorbent properties toward various types of contaminants (i.e., petrochemicals, pharmaceuticals and agrochemicals). By comparison, synthetically engineered biomaterials that utilize chitosan building blocks display remarkable sorption properties that are tunable toward various types of waterborne contaminants. Recent advances in materials have enabled the development of a nanofiltration media with relative ease, low toxicity and tunable molecular properties for a wide range of environmental remediation applications. The design strategy is illustrated in Figure 1. Figure 1. Design chitosan-based nano materials (molecular sponge) through the cross linking of a multifunctional polysaccharide (triangle) and a bifunctional (rectange) linker until to form a porous network. Figure 2. 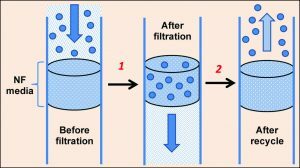 Adsorption-desoption by nano media in water with contaminants; Step 1, adsorption and Step 2, desorption after recycling. The nano-based biomaterials possess versatile and tunable sorption properties toward a wide range of waterborne contaminants (e.g., phenolic dyes). In terms of adsorption-based applications, the design strategy in Figure 1 affords nano sorbent materials with variable surface area, pore structure properties and tunable surface chemistry, suitable for a wide range of target contaminants. 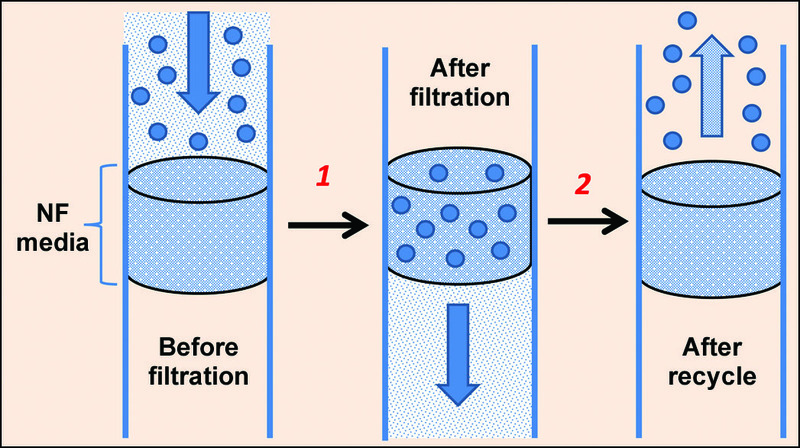 Figure 2 illustrates the general strategy for the adsorption-desorption of waterborne contaminants. 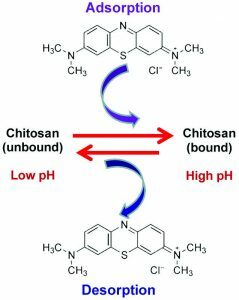 In a recent bench-scale test of tainted water containing a textile dye (see Reference) that demonstrated an example of an industrial application of chitosan-based materials, a series of synthetically engineered materials were prepared, which display remarkable tunable behavior. The latter refers to tunable binding affinity ranging from reversible (low affinity) to irreversible (high affinity) according to the composition of the sorbent. The remarkable binding of the high-affinity material was demonstrated by its switchable behavior in water at variable pH conditions. (The controlled uptake and release of dye from simulated wastewater conditions is shown in Figure 3). The ability of the sorbent material to adsorb and desorb the industrial dye was attributed to pH switching of ionic groups on the sorbent surface, by reversing the surface charge of the material from a neutral state (at low pH; ~ pH 2) to a negatively charged surface at pH 6. Switching of the surface charge from neutral to negative states results in repulsive and attractive interactions with a positively charged dye, such as methylene blue, as outlined below. More recently, researchers have prepared a range of synthetically engineered materials with unique uptake properties toward waterborne contaminants with highly varying lipophilicity and hydrophilicity. 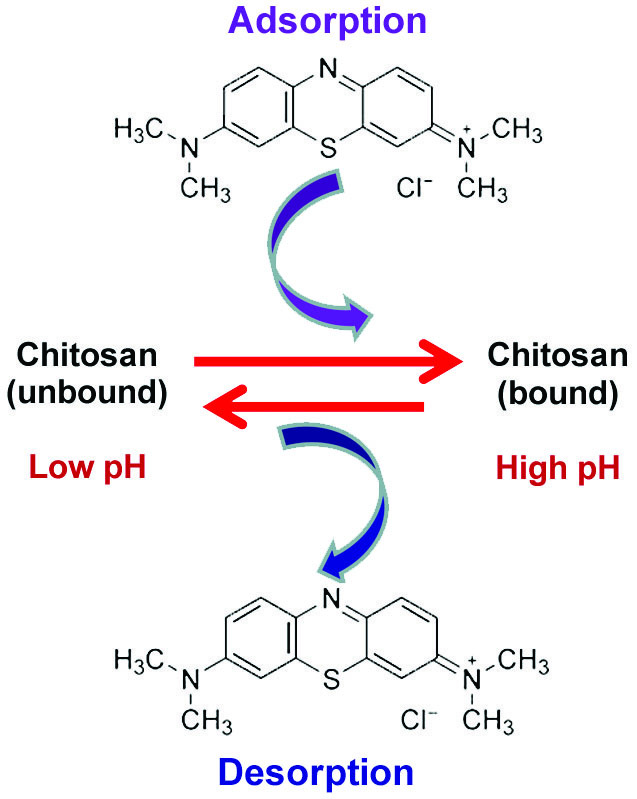 Multi-component copolymers containing chitosan were prepared and their sorption properties with organic dyes and inorganic species were investigated. In contrast to pure chitosan, the copolymer materials display substantially greater sorption capacity in accordance with their structure and composition. This work represents a significant contribution to the field of tunable and modular biomaterial adsorbents for the molecular recognition of textile dyes and inorganic/organic anions in aqueous solution. Wastewater is treated in phases to optimize the use of the chitosan copolymer powder. In the first phase, water is frothed with air via a patented dissolved air flotation (DAF) device with high-frequency ultrasonic waves. This causes light particles to float to the top and heavy ones to fall to the bottom, a process accelerated by a patented centrifugal separator. Light particles including fats, oil, grease and algae-producing biofilm that float to the top are removed by skimming; heavy particles simply sediment to the bottom and are removed from there. In the second phase, water is zapped with electricity using a patented electro-coagulation unit. Electric charge causes metals, minerals and metallic compounds to become insoluble; i.e., separated from water molecules and fall to the bottom, from where they are easily removed. In the third stage, the nano-powder is applied to trap soluble materials as well as any other contaminants that still remain in the wastewater. These include sugars, detergents, hormones, alcohol and some organic compounds. Once wastewater has gone through the three stages of treatment, it is colorless, odorless and safe for environmental disposal or general industrial or agricultural use. Should the water be needed for drinking purposes, it undergoes a biological purification in stage four. This involves treatment by ultraviolet, ozone gas, ultrasonic resonance or a combination of the above. Nano-sorbent materials can be used to treat black water; however, there may be some issue with fouling if the level of suspended solids is high. This can be addressed in a system that integrates flocculation-coagulation and filtration. Nano-sorbent materials are considered promising in the case of trace organic contaminants, such as pharmaceuticals and petrochemicals. Adsorbent materials represent a modular technology from several standpoints. Their synthetic modification enables targeting of particular waterborne contaminants of interest. As well, the utility of stand-alone filtration cartridges or their integration within a multi-step purification system provides effective water treatment for a variety of applications to industry. Dr. Lee D. Wilson completed a PhD in physical chemistry from the University of Saskatchewan (1998) and was an NSERC (The Natural Sciences and Engineering Research Council of Canada) Visiting Fellow at the National Research Council of Canada at the Steacie Institute for Molecular Sciences. Currently an Associate Professor of chemistry at the University of Saskatchewan and on the Advisory Board of NanoStruck Technologies, Wilson has led the development of a nano-chitosan copolymer powder, a derivative of crustacean shells being used exclusively by NanoStruck Technologies for its water remediation technologies.